The Rundown: As the old saying goes- Third time's a charm! After the mediocre showings of the first two 2011 Hallmark ornaments, I'm happy to tell you that I saved the best for last. 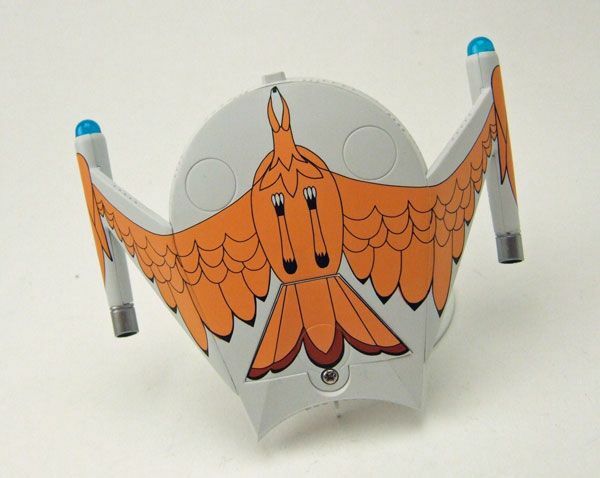 This year's ship entry, the Romulan Bird-Of-Prey, definitely rules the roost amongst his 2011 brethren... but that isn't really saying much, is it? Let's take look at her and see if she is actually worth plunking down the money for. Not only did Hallmark maintain the integrity of the shooting model by not adding silly things like unnecessary gridlines, but they also did an incredible job of recreating what small details were visible on the original prop. Compare the number of "portholes" and their placement between the two pictures. Go ahead. I'll wait for ya. Done? Yeah, they match pretty darn well, don't they? Good job Hallmark! Of course, the most integral element to a good Bird-Of-Prey replica is the fowl decoration located on the underside. I have zero complaints with Hallmark's rendition here. The paint lines are nice and tight, with no mismatch between the pattern and the coloring. 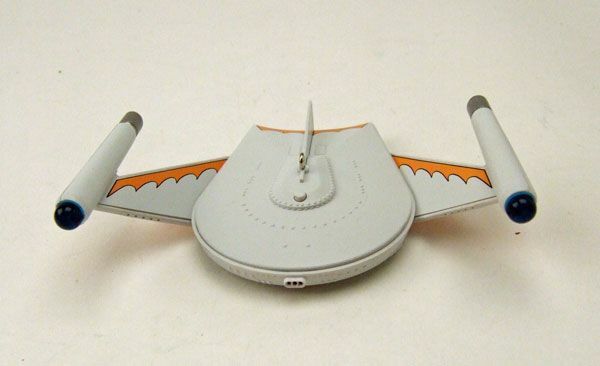 I also have to give them kudos for incorporating the battery cover into the tail feather portion of the image. Pretty sneaky sis! Pretty sweet, eh? Not sure how well it translated in the video, but the nacelle lights are SUPER bright. Some folks may have issue with the color chosen for the effect, but I personally dig the blue. It looks really sharp. Oh.. and I actually had no idea that the front part lit up until it started blinking. Excellent work all around! 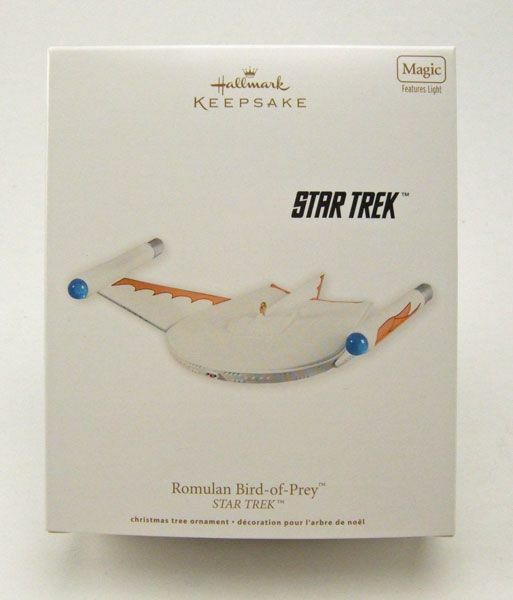 At $32.95, the Romulan Bird-Of-Prey is the most expensive of this year's Hallmark Trek offerings. Thankfully, it also happens to be the best of the bunch. 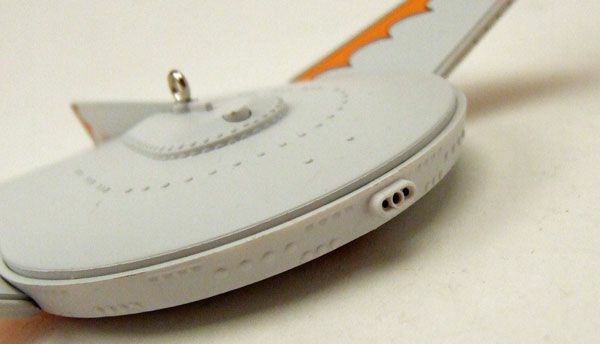 If money isn't really a factor, but you only have room on the tree for one 2011 Trek ornament, make it this one. It really is quite cool, and it would look great hanging near the original Enterprise (if you have that golden oldie). With the high price, you may be tempted to wait out the inevitable post-season clearance, but I have a feeling this one will be the first one to "disappear". 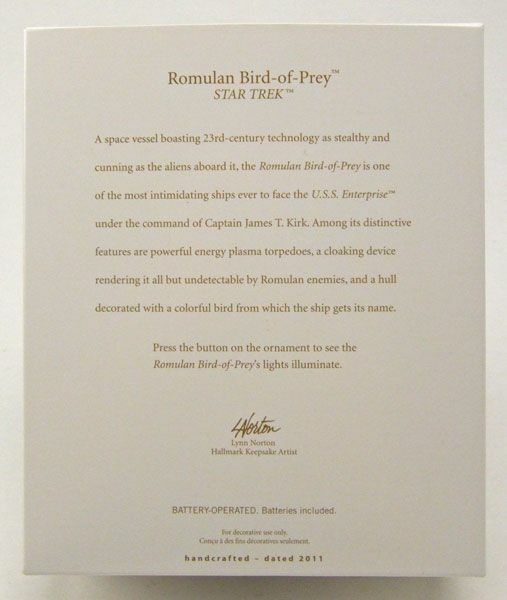 After all, it is a Romulan Bird-Of Prey... Ya get it? "Disappear"? Because it can cloak! Ha! 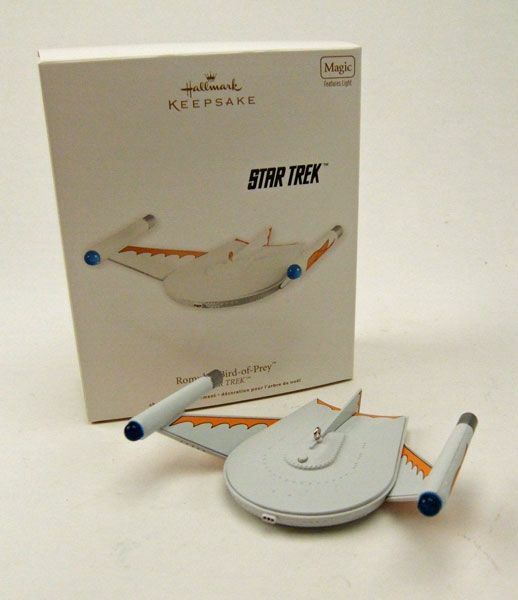 This was the must have purchase of the Trek ornaments offered, though I will get the other two eventually. Great review for an AWESOME ornament. James, are the wings pointed upwards too much?